Legal wedding ceremony for up to sixty people. Your guests will talk about your amazing doughnut presentation for years to come. 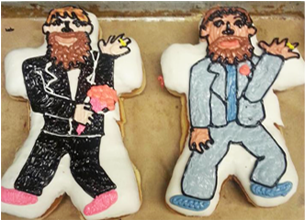 Make your wedding a memorable event that no one will forget at Voodoo Doughnut. Legal Wedding Ceremony for up to 60 people. 7 Staff Picked Voodoo Dozens. 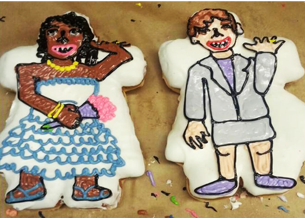 Voodoo Doll bride & groom custom doughnuts. 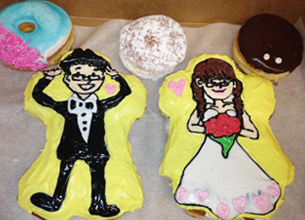 The couple’s names spelled out in doughnuts. 3 airpots of coffee (as needed). Please provide the details of your ceremony plans, including how to reach you, and we'll be in touch to get everything set up! Please note that couples are responsible for obtaining their wedding license for all legal ceremonies. We will take care of the rest! Visit our Contact Page and reach out!